The video game industry does things a little bit different so, when USC Games hosted a career fair/demonstration for video game designers, it wasn't a typical career fair. On December 12th, The School of Cinematic Arts’ Interactive Media Division combined forces with SCA’s Student Industry Relations and Viterbi’s School of Engineering to create Demo Day, a day long celebration of the video game industry. "The event exceeded everyone's expectations - we wanted to raise the bar on the kind of in-depth interaction our students have with industry professionals during our end of semester shows, and we wound up setting a whole new standard for these kinds of events," said USC Interactive Media Division Chair Tracy Fullerton. "The students were so excited they were calling it the 'E3 of USC' on Twitter." Demo day, a collaborative effort between the School of Cinematic Arts’ Interactive Media Division and the Viterbi School of Engineering’s Department of Computer Science, was an exhibition event where students had the opportunity to premiere their newest and most innovative games from the semester. In addition to students from across USC, other participants included students from institutions such as Laguna College of Art & Design and Atlantic College in Puerto Rico. HR executives from many of the industry’s top games companies, including Electronic Arts, LucasFilm, Riot Games, Activision and Blizzard, were present for either individual interviews and/or general meet and greets in the Harold Lloyd lobby, while students tested their games within SCA’s Gallery space. 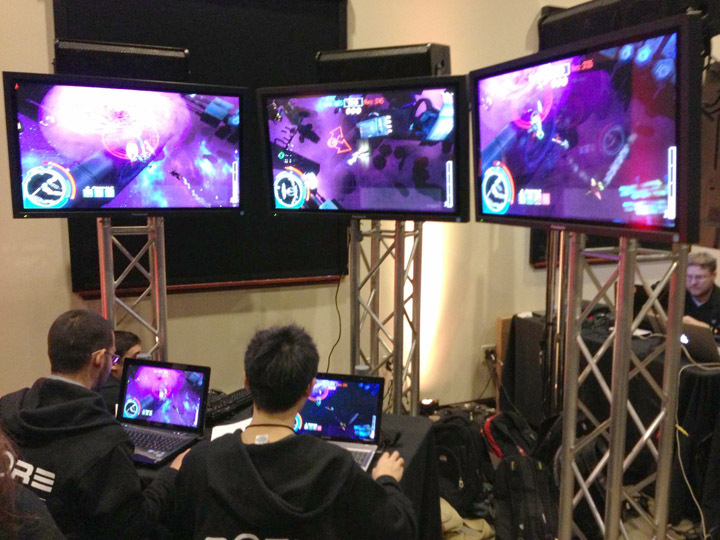 Demo Day featured an impressive variety of game demonstrations, allowing participants to show their work to HR representatives instead of just a resume. "The collaboration between the School of Cinematic Arts and Viterbi is a unique relationship that makes USC games distinct," continued Fullerton. "Each program has its own specialities, and the students from each program bring those specialties together to design and develop the advanced games that are shown at Demo Day. It's as close as you can get a true industry-level development experience in an academic setting. The complexity of these projects and the intensity of the hands on learning these students encounter is without equal." USC was voted the #1 game design school in North America for graduate and undergraduate degree programs by the Princeton Review and GamePro Media for the past three years. This distinction was jointly awarded to the School of Cinematic Arts’ Interactive Media Division and the Viterbi School of Engineering’s Department of Computer Science.